Reaching our Potential with Respect, Care and Friendship. Our first year students had a great time when they visited the BT Young Scientist and Technology Exhibition recently. On Thursday, 10th January, our First Year students and their science teachers went to Dublin to visit the BT Young Scientist and Technology Exhibition. This was a wonderful opportunity for them to see young people their own age putting the knowledge they acquire in the classroom into practice in the real world. We hope that they took inspiration from the remarkable young scientists that were displaying their projects at the exhibition. Maybe it ignited a spark of curiosity in one of them………we would be very proud to see one of them displaying their own work at this prestigious event some day in the future!! Well done to all of the Ard Scoil athletes who competed at the County Schools Track and Field Championships recently! Ard Scoil students helping out in the community! 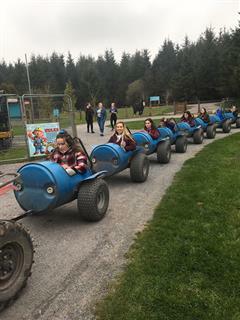 Transition Year students had a great day out at Leahy's open farm and chocolate factory! 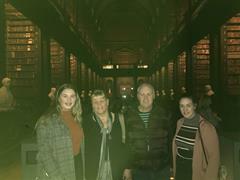 Well done to Ciara Walsh on her recent success in the Trinity College Dublin essay writing competition!